Nelson Cortez was inspired at a young age by watching his mother and father prepare traditional meals and quickly found a passion for the culinary arts. Today, he brings smiles and full stomachs to guests every day as room chef at Aliante’s signature Mexican cantina and eatery, The Salted Lime. In his position, Cortez oversees all efforts at The Salted Lime, including the execution of menus, ordering of products and managing staff. 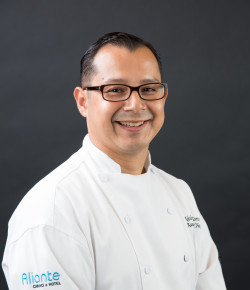 Prior to joining Aliante, Cortez served as part-owner and executive chef of El Torito Grill and executive chef of Crews of California Rock & Brew in Los Angeles. His previous experience also includes time at Red Rock Casino Resort & Spa, Sodexo Campus Services and the Radisson Wilshire Plaza Hotel, among others. Cortez has received numerous accolades in cooking competitions and is a culinary graduate of Los Angeles Trade Technical College (LATTC). In his free time, Cortez enjoys playing soccer, cooking and putting together brainteasers with his wife and two children. A former business owner, Shawn Brown left the corporate world to follow his joy of food and started his culinary career at Aliante in 2011. He has since grown within the property with hard work and dedication to become room chef at FARM 24-7, Aliante’s 24-hour farm-to-table café. In his position, Brown is responsible for overseeing all kitchen operations for the 24-hour café, including ordering ingredients, scheduling staff, working with management and maintaining the highest health and safety standards. Brown began his career at Aliante at Medley Buffet and has worked his way up through Bistro 57 to his current role at FARM 24-7. He studied at The Art Institute of Las Vegas and Le Cordon Bleu College of Culinary Arts while working a full-time job to pursue his dream and is inspired by the happiness and togetherness that food can offer. Brown was a professional drummer for 14 years and enjoys spending time with his children as much as possible, often watching popular cooking and travel shows on The Food Network. Chef Todd Ulrich has always been inspired by other chefs, whether watching them on TV or getting to know them personally. 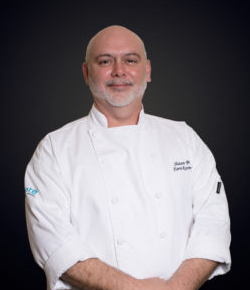 When offered the opportunity to work at Aliante Casino + Hotel + Spa alongside Executive Chef George Jacquez, Ulrich knew it was a chance he didn’t want to pass up. “I am honored to work at such an excellent property alongside chefs who I admire and am able to learn from each and every day,” said Ulrich. Ulrich most recently served as room chef during the opening of Red Rock Casino Resort & Spa in 2006 along with Jacquez. 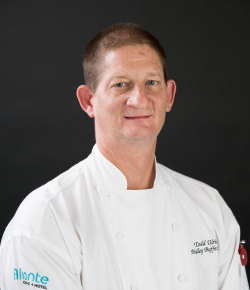 Most of his previous experience includes time in Chicago, including opening and managing the café style restaurant, La Piazza; seven years as sous chef and executive chef at the former Barney’s Market Club; more than a year as the banquet chef at the Ritz Carlton in Chicago and eight years as owner of TNT Pizza & Pasta. He is a graduate of Le Cordon Bleu College of Culinary Arts in Chicago (formerly the Cooking and Hospitality Institute of Chicago). When not taking the lead in the kitchen Ulrich enjoys getting out on the greens to play golf or hitting the alley to bowl. He also enjoys traveling.